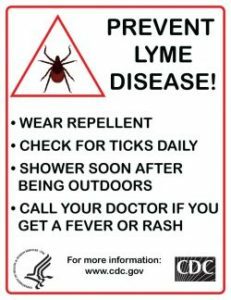 Lymes disease is an infection which is transmitted by the bite of a tick who is carrying the bacteria known as Borrelia burgdorferi. Antibiotics are the primary treatment. However, many patients still suffer from a variety of symptoms even when the lab tests show they are free from infection. Additionally, side effects from long term antibiotics need to be addressed to fully restore the body to optimal health. Did you know antibiotics not only kill the bad bacteria, but it also kills the beneficial bacteria in your body. 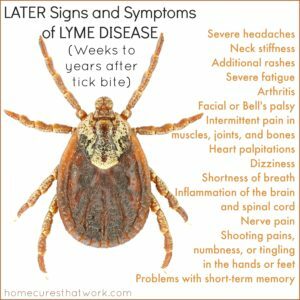 It is important to take all factors into consideration while you are recovering from Lyme’s. Eating a healthy well balanced diet is important. Unfortunately there is a lot mis-information that you are bombarded with, often it is hard to know what is healthy, and what isn’t. We would love to help you find your perfect nutritional plan. Exercise daily. Need help with that? Contact us & we can come up with the perfect exercise routine that fits your needs & fitness level. Drink a minimum of 64 ounces of pure clean water daily. This sounds simple, but for most people this is very difficult. If you need suggestions of how to up your water intake contact us. Sleep at least 8-10 hours a night. Every living thing on earth needs good sleep. This is the time where you body rests and heals itself the best. If you have trouble falling asleep and/or staying asleep Amare Global offers a Menta Therapeutic called Sleep. The key ingredients in Sleep+ have multiple scientific studies that show significant benefits including helping you to fall asleep faster, stay asleep longer, and experience higher quality plus more rejuvenating sleep. Click here to shop.
. Manage your stress. There are many basic ways to help you reduce stress. Meditation and/or Reiki are great complementary Alternative therapies to lower stress. Amare Global is the leader in Mental Wellness. They offer Menta Therapeutics that provides an all natural mood support. The key ingredients in Mood+ have multiple scientific studies that show significant benefits for mood support such as relief from anxious feelings, sadness, restlessness, and overall stress relief. Click here to shop. Find an Acupuncturist; specifically, one who specialized in 5 element Acupuncture (AKA 5 Phase Acupuncture). Five Element theory has been used for more than 2,000 years as a method of diagnosis and treatment. Rooted in ancient wisdom it is an effective and unique system of medicine that diagnoses and treats the cause of disease. Find a Chiropractor; specifically, one who specializes in pediatric care. A licensed Chiropractor will address health conditions associated with the nervous and musculoskeletal systems. Using gentle, noninvasive and drug free, chiropractic adjustments to treat, resolve and prevent a wide range of health problem. After you have completed any Antibiotic treatment is necessary to rebuild the body’s immune system. Take a B Complex and a vitamin K supplement. Antibiotics deplete the body of biotin, folic acid, inositol, vitamin B1, vitamin B2, vitamin B3, vitamin B6, vitamin B12, and vitamin K , and therefore it is necessary replenish your body with those vitamins to restore optimal health. WEI Brown Juice helps improve the liver structure & function. Take ¼ cup, 2 times a day. 11. WEI LC Balancer is recommended to improve the microcirculation and resolve the fibromyalgia due to the toxin build up in the muscle and joint. Additionally, LC balancer may help improve kidney health for effective waste excretion. Take 1 teaspoon, 3 times per day. 12. If you have constipation or diarrhea due to intestinal infection take the WEI PA Capsule 1 capsule, 3 times per day. If you are interested in the PA Capsule, please contact us. 13. If you have poor kidney function, which can cause headache, muscle cramps, and fatigue, take WEI Xcel, 2 capsules, 3 times per day. 14. If you have brain dysfunction and degeneration, brain fog, memory loss, and other brain related symptoms after all the other treatments have been exhausted there is a treatment to improve the brain blood barrier function. Please contact us for information relating to any neurological condition, and seek attention from your physician. 15. Thyme Essential Oil, diluted with a carrier oil, drop 5-10 drops on the spine and massage in gently. Other essential oils commonly used are: frankincense, helichrysum, lemongrass bergamont and clove. 16. Taking the supplement CoQ10: supports cardiac health, alleviates muscle pain and reduces brain fog. As always it would be our honor to assist you. If you have any questions please don’t hesitate to reach out to us.